Some things in life are very dependable. The sun rises in the east, water flows downhill, and Paul Krugman thinks Nobel Prize winning economist Paul Krugman smiles during the World Business Forum in New Yorkbalancing the budget during a recession or weak recovery is a terrible idea. Indeed, on this last point, recall Krugman’s late 2008 lament over the “50 Herbert Hoovers”–the 50 governors who were striving to balance their budgets amidst plunging revenues, because states are not allowed to run deficits the way the feds can. Also recall that throughout the recession (and tepid recovery), Krugman has often pointed out that the proper gauge of U.S. “austerity” was total government spending–federal, state, and local. (See this post, for example.) 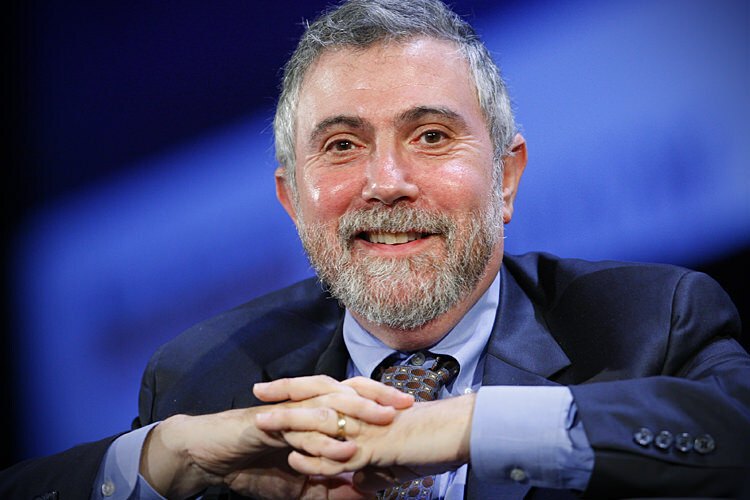 Krugman would roll his eyes at people who merely looked at federal spending under the Obama Administration to try to show the U.S. government wasn’t really all that austere–didn’t these clowns know that you had to include the fiscal policies of the 50 Herbert Hoovers too? In this context, when the NYT runs an article about the many states that actually ran up huge debts during the recession and recovery, surely Krugman would be applauding those governors. After all, they did their part to boost aggregate demand by running big deficits, so that the state government could partially counteract the shortfall in private sector spending. Phew! Ha ha, fooled you. Krugman actually took the opportunity to excoriate the governors who ran up government debt and thereby caused “an epidemic of fiscal crisis” (his term). Can you guess why? Since when does Krugman think that running up deficits since 2008 is a bad thing? The answer is that most of the debt was accumulated under Republicans, and the budget shortfalls were from tax cuts, not spending increases. (Note: I have not gone and verified the actual budgets of the states in question. Let’s assume Krugman’s narrative is accurate.) Economist David R. Henderson tries to be a nice guy and come up with escape hatches for Krugman, but I think on this one we can go with the quite obvious hypothesis: Krugman only embraces Keynesian logic when it reinforces his political preferences for more government spending. I know he assures us he’s not biased, but, well, that’s just what a biased person would say. So now we have ironclad proof: Krugman really is against budget deficits when they’re due to Republican officials. He was against them during the George W. Bush years, and now he says that that’s because we weren’t up against the zero lower bound. OK, well according to Krugman we were up against the zero lower bound since 2008. So at best he should be saying, “Don’t get me wrong, I’m glad those Republican governors ran up large debts. I’m just pointing out their hypocrisy.” But instead, he actually refers to an “epidemic of fiscal crisis.” One does not get the sense from his post that he thinks those Republican governors did their states any favors by priming the pump. This article was previously published on Mises Canada on June 11, 2015.